is a good way to get yourself dead. The Hateful Eight is two thirds tense talky thriller and one third traditional Tarantino bloodbath. The plans of John “The Hangman” Ruth [Kurt Russell] to claim the bounty on his captive, Daisy Domergue [Jennifer Jason Leigh], are complicated by an approaching blizzard. Racing for shelter, their stagecoach picks up two men stuck on the road, Major Marquis Warren [Samuel L Jackson], another bounty hunter, and Chris Mannix [Walton Goggins], former rebel soldier and future sheriff. When they reach the cabin in which they plan to wait out the storm, the owners are gone and they find a shady collection of guests with whom they will be spending the night. It soon emerges that at least one of the men has designs on freeing Domergue before she hangs. This is a film designed for those who wished the tense opening scene of Inglorious Basterds had continued for the entire film. This is similarly a script in which Tarantino expertly creates action sequences through dialogue alone. Dangerous characters circle one other, using careful questions to probe for weaknesses, taking cover behind lies and attacking with accusations. An unhurried Tarantino shows notable restraint in delivering a film where the first gunshot rings out over halfway through the film. 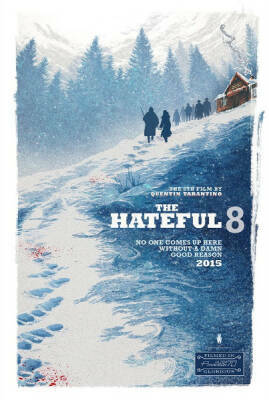 This relies on a strong cast, comprising many Tarantino regulars and a few new faces. We know what to expect from those like Jackson, Tim Roth and Michael Madsen. 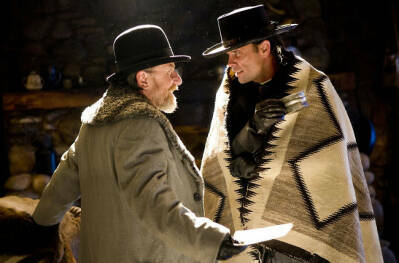 Walton Goggins excels, bringing a more energetic version of his antagonist Boyd Crowder in Justified. Russell, an imposing physical presence, is given more to work with than in Death Proof and delivers, whilst Leigh delights in venomous delirium. The camera work is beautiful, from the difficult white outdoor sequences to making sense of the cluttered interiors. The cabin feels at times expansive or claustrophobic as the scene requires. Of particularly note is a scene in which Daisy plays the guitar in the foreground whilst other characters interact at the far side of the room, with the camera panning and pulling focus between the two with expert precision that contemporary films rarely attempt. The “roadshow” version of the film is a true spectacle, projected in 70mm and showcasing Tarantino’s love of old Westerns as he indulges in wide, languid shots of sweeping vistas that are excised from the general release (its running time is shorter by twenty minutes). It would not be a classic Western without an Ennio Morricone score, of course, which is brought to the fore with an opening overture preceding the film. It also brings a carefully timed interval punctuating the proceedings. Up to that point, the film’s tempo is impeccable, ratcheting tension while exploring the relationships between characters and, in particular, racism in the southern States following the loss of the civil war. The way in which characters voice their own racism — whether open or more insidious — and seek to exploit others’ racist beliefs is as much a commentary on modern America as a historic one. 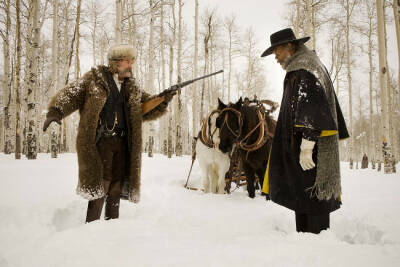 Following the interval, the film becomes a familiarly loose Tarantino pastiche. Unfortunately Tarantino sometimes gets in his own way. This is immediately evident from an unnecessary voiceover explaining what could have been more effectively shown simply by returning to the previous scene from an alternate angle. The gore is by turns visceral and cartoonish, resulting in a somewhat inconsistent tone even within the more violent portions of the film. It would be easy to criticise the film for this late tonal shift and inconsistency but at this point Tarantino films are almost a genre unto themselves. Where in the past Tarantino paid homage to the films he loves, now he is almost doing the same to his own style of film-making. From that viewpoint, whilst not his finest, The Hateful Eight is a Tarantino film par excellence.